America's current Fuhrer gave a speech last night outlining his plans for a new American onslaught of war and death. So while the Mercury-Pallas conjunction is fueling peace initiatives (Ukrainian ceasefire, EU's refusal to extend sanctions against Russia), the Pallas-Pluto trine still has an effect which will eventually lead to many deaths. The chart for Obama's speech, fittingly, fulfills the Bloodbath Formula. 1. 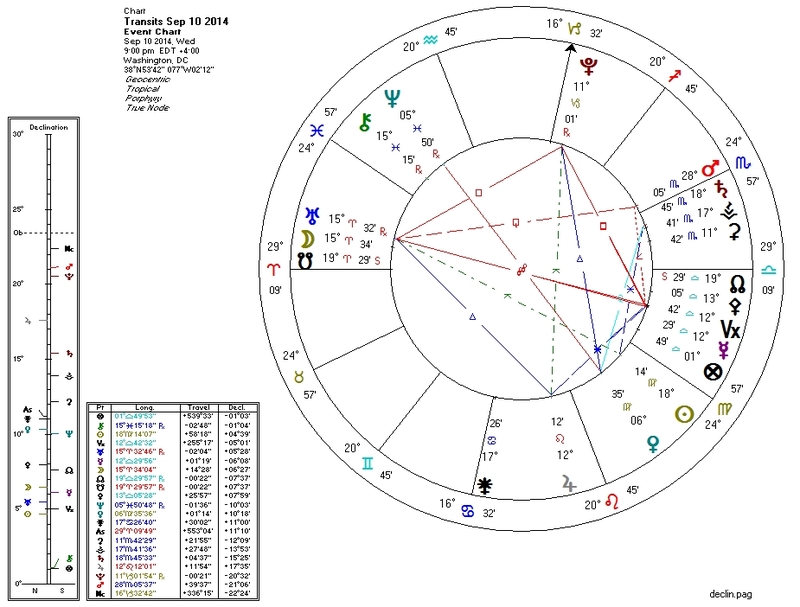 Pallas square Pluto and ruled by Venus which is trine Pluto. 4. Moon square Pluto. Moon rules the Fourth House. 5. Sun widely trine Pluto (which is also trine Venus, ruler of the Sun). The Moon/Uranus/South-Node triple conjunction is especially striking, possibly representing extreme disruption and draining of people/home/land. The Pallas/North-Node conjunction suggests that this new offensive might not last as long as our bloodthirsty overlords might want.